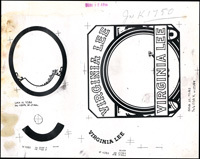 The Progressive proof book for the Virginia Lee cigar label of the Seidenberg Cigar Company. At the turn of the century, The Havana-American Co. purchased the Seidenberg Co. and operated it for a number of years, later closing it. Digitized with funding from the <a href="http://www.imls.gov/">Institute of Museum and Library Services</a> as part of the Ephemeral Cities grant project.